Researchers have pieced together the three-dimensional skull of an iconic, toothed bird that represents a pivotal moment in the transition from dinosaurs to modern-day birds. Ichthyornis dispar holds a key position in the evolutionary trail that leads from dinosaurian species to today’s avians. It lived nearly 100 million years ago in North America, looked something like a toothy seabird, and drew the attention of such famous naturalists as Yale’s O.C. Marsh (who first named and described it) and Charles Darwin. Yet despite the existence of partial specimens of Ichthyornis dispar, there has been no significant new skull material beyond the fragmentary remains first found in the 1870s. Now, a Yale-led team reports on new specimens with three-dimensional cranial remains — including one example of a complete skull and two previously overlooked cranial elements that were part of the original specimen at Yale — that reveal new details about one of the most striking transformations in evolutionary history. 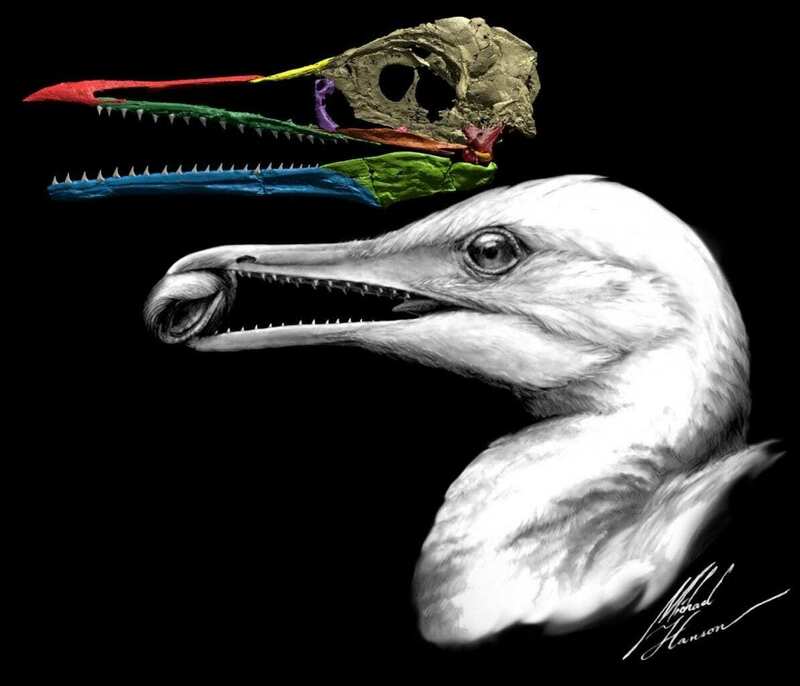 Perhaps most interesting of all, Bhullar said, is that Ichthyornis dispar shows us what the bird beak looked like as it first appeared in nature. The research team conducted its analysis using CT-scan technology, combined with specimens from the Yale Peabody Museum of Natural History; the Sternberg Museum of Natural History in Fort Hays, Kan.; the Alabama Museum of Natural History; the University of Kansas Biodiversity Institute; and the Black Hills Institute of Geological Research. Co-lead authors of the new study are Daniel Field of the Milner Centre for Evolution at the University of Bath and Michael Hanson of Yale. Co-authors are David Burnham of the University of Kansas, Laura Wilson and Kristopher Super of Fort Hays State University, Dana Ehret of the Alabama Museum of Natural History, and Jun Ebersole of the McWane Science Center. The researchers said their findings offer new insight into how modern birds’ skulls eventually formed. Along with its transitional beak, Ichthyornis dispar had a brain similar to modern birds but a temporal region of the skull that was strikingly like that of a dinosaur — indicating that during the evolution of birds, the brain transformed first while the remainder of the skull remained more primitive and dinosaur-like.